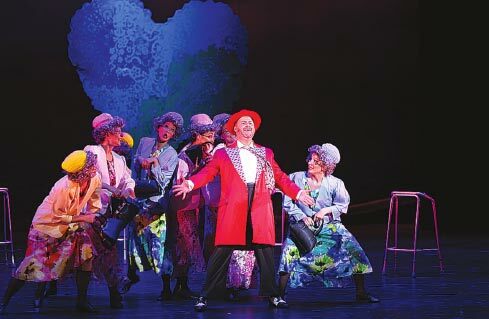 At the end of the year, Shanghai Culture Square, the city's leading musical theater, is presenting four major Western musicals, a testament to how Shanghai has become China's most vibrant market for such productions. Tony Award-winning musical The Producers started its China tour on Nov 1 with a two-week run in Shanghai. A total of 100 shows have been scheduled to take place across Chinese cities including Beijing, Guangzhou, Hangzhou and Macao. The other three productions are West Side Story, Legally Blonde and Mozart l'opera rock. "We have developed this tradition of bringing heavyweight shows to the city at the end of the year when people are in the mood for fun and are ready to spend," said Fei Yuanhong, artistic director of Shanghai Culture Square, a State-owned company responsible for the theater operation as well as bringing in and creating performances. "Our productions include a classical masterpiece, an Americanstyle comedy and a French tragedy, so there is something for everybody." Broadway productions debuted in China in 2002. The first musical that was shown was the well-loved epic Les Miserable, which had a three-week run at the Shanghai Grand Theater. In the following years, Shanghai Grand Theater presented a major Broadway production every year, including Mamma Mia, The Phantom of the Opera and The Lion King. These shows were so popular with audiences that the city decided to build a new theater dedicated to musical performances. Established in 2011, Shanghai Culture Square has since become the city's premier location for musicals. Apart from Broadway performances, the venue has also hosted German, French and Chinese productions. To promote their offerings, Shanghai Culture Square organizes regular lectures and workshops that accompany a performance, as well as public engagement activities. Earlier this year, when Shanghai Culture Square announced that it would be showing Legally Blonde, the theater held a casting event for dogs. "The production requires two dog actors. This is the first time our theater will have dogs acting in a musical, so we came up with the idea of auditioning for dogs. It was a fun event, and quite a successful promotion campaign for the play, though we didn't find the right dog actors," said Fei. Shanghai Culture Square eventually bought two dogs for the job and had them trained by professional coaches. One of the puppies, a Chihuahua named Bruiser after its character in the play, has been living in the theater to adjust to the crowd and noise. It has become popular among those queuing to buy tickets at the theater.